Since 2015, the “Green Team” at St. Paul’s has promoted creation care as one way to live out our faith. We help discern and implement ways church operations can become more environmentally sustainable; we encourage and empower fellow parishioners to make similar commitments to environmental stewardship in their own lives; we offer opportunities and resources to connect creation care with spirituality, advocate for environmental issues within the community, and encourage a love and reverence for the natural world. Creation Care is a recognized ministry within the Episcopal Church. Parish Garden—The parish garden reminds us all where our food comes from and the ways in which God’s good earth, along with our own labor, provides nourishment for our bodies, minds and souls. 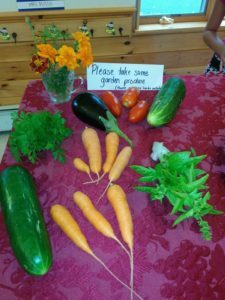 The organically grown vegetables are currently shared with parishioners but future expansion may allow us to donate some to the local Community Pantry. Earth Sunday—Earth Sunday is celebrated by many churches on the Sunday closest to Earth Day, April 22. St. Paul’s frequently invites guests to both preach and speak to the congregation. We also observe “Bike to Church” on this Sunday. Learning series on Pope Francis’ Environmental Encyclical, Laudato Si, co-sponsored with the Bedford First Parish Unitarian Universalist community (2015). Eco-Stewardship in the Home—The Team is developing a list of practical steps families can take to care for creation in their homes and communities, as well as in the wider world. We take seriously the adage to Reduce, Reuse, and Recycle! Support regular recycling drives and the annual parish Thrift Sale—These both predate the Green Team, but we enthusiastically support these popular efforts to reuse and recycle household items. 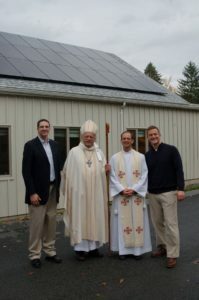 Installation and dedication of a 12 kW solar panel array on rear-roof in 2015 that generates about 85% of the church’s annual electricity needs. Completion of an Energy Audit by Mass. Interfaith Power and Light to identify areas for future carbon footprint reduction. Installation of high-efficiency windows in the sanctuary, increased insulation, and LED lights in the parking lot, with the assistance of two Diocesan ‘Green Grants’ and funds from a recent Capital Campaign. Inauguration of the Parish Garden, providing opportunities for children and adults to interact with the natural world and grow fresh vegetables, reminding us all of God’s bounty.